This is the underground city of Nirfaldir. 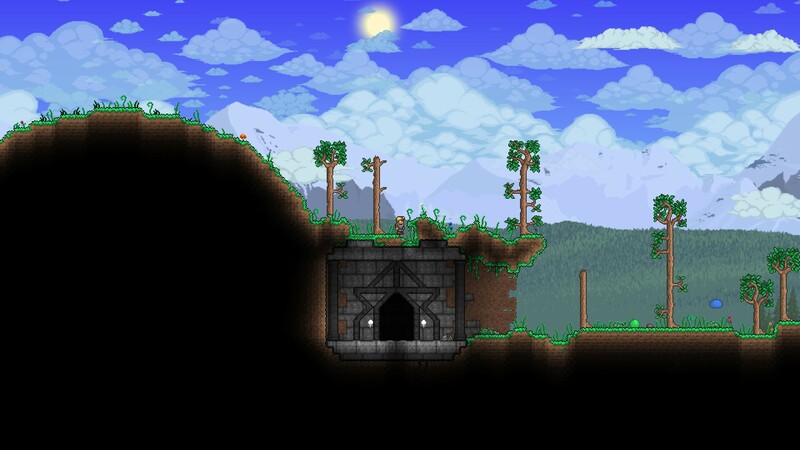 It contains sufficient housing for all NPCs, including a few themed buildings for the Wizard, Angler, Truffle, Steampunker Witch Doctor, and Dryad. There are currently no NPCs other than the Guide, as I wanted to try and keep the world as "fresh" as possible for those of you who might want to play through with a new character. To enter the city, head east from the spawn through the giant tree until you find the stone archway. The residential section is denoted by the green brick walls, with the mercantile sector being in blue and the royal chambers in pink. The furniture was intentionally left out of the buildings in the town so that you could fill them with whatever you like, so don't be afraid to make it your own. On the surface, the Dryad's tree and Wizard's tower are just to the east of the entrance to the city, the Witch Doctor's home is in the jungle, and the Angler's beach house is on the western shore. I hellevatored the giant trees to give easier access to the Underworld and to help slow the spread of the corrupted areas. Make sure to pay attention, though, as there are no bottoms to the hellevators, so you'll need to grapple or otherwise slow your falling speed. I generated the world with TerraCustom, so it has both Corruption and Crimson. I also included some hardmore ores in the initial generation of the world. If you find anything that seems out of place or that you think needs any kind of fixing, please do let me know so that I can take care of it. All buildings are my own builds, with the exception of the Angler's house, which I re-created from: http://www.terrariaonline.com/threads/slimeassic-park.149347/ I am using it with the permission of SovereignVis, the original creator of the building.